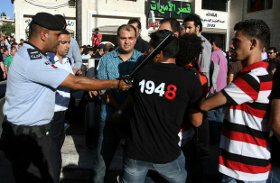 Palestinian Authority 'police' thugs beat demonstrators. 10 hospitalised. Prof Hassassian, envoy of the PA in London, is silent. 10 hospitalised. Look at the welts on the man's back. Your association, the Palestinian Authority, is competing with the Zionist entity in cruelty. Please assure us that the Blair/Gayton/CIA/MI6 thugs will be called off, the wrongdoers prosecuted and your fellow Palestinians treated with respect. I share your revulsion regarding torture and in several ways I have spoken very strongly against it. But I know also that the Blair/Gayton sponsored Palestinian 'security' personnel have carried out atrocities. I have in mind the torturing to death of Sheikh Mustafa Barghouti and others in Palestinian gaols. Assure us that this has stopped - completely. about the greatest cruelty of the entity's snipers at Beit Hanoun. To shoot working boys in the legs should lead to the international arrest of the psychopaths leading the occupation forces of the entity. Instead my paper, written over Christmas, was refused by the BMJ (a mostly Jewish editorial staff) and Dr Richard Horton, of the Lancet, who is said to be so sympathetic to the suffering of the Palestinian humans, but he did not reply TWICE to my e-mails. The only consolation is that the paper travelled widely on the internet but I wanted complacent, unfeeling doctors to read it. The 26th of June marks 'International Torture Day' in which we were reminded of the 4,659 Palestinians currently held in Israeli Jails that are denied their basic human rights, legal representation and dignity. What marks International Torture day this year is the mass hunger strike launched by Palestinian prisoners protesting against the torture and ill treatment policies that are practiced in Israeli prisons. A recent report marking the United Nations International Day in Support of Victims of Torture revealed that an overwhelming 100% of Palestinian prisoners in Israeli jails suffer physical and psychological torture at the hands of the brutal Israeli military regime. > The report indicated that 91% of the prisoners were pushed around and beaten, 82% were deprived of sleep, 85% were forced to remain in uncomfortable positions for long hours, 95% did not receive healthy drinks or food, 57% were exposed to excessive heat or cold, and over 63% were beaten in gentiles. Currently there are 192 Child prisoners of which around 90% children were exposed to violence and beaten, while about 16% of them were sexually harassed and threatened, said the report, adding that illegal Israeli settlements in the Palestinian Territory turned in recent years into torture centres, especially of Palestinian children. Over 1500 Palestinian prisoners recently took part in a mass hunger strike to demand an end to their harsh conditions in Israeli jails, an end to torture and harassment, ritual humiliation and degradation. The plight of Palestinian political prisoners demanding freedom and dignity is enjoined with the Palestininian struggle for freedom, peace and justice for the Palestinians as a collective in their homeland. The Israeli apartheid state continues to dehumanise and control the Palestinians through weapons of torture, subjugation and the defiling of Palestinian rights and human integrity. Despite international pressure and legislation, Israel continues to defy the international community and continues its ill treatment and torture of Palestinian prisoners of war. 178 UN resolutions condemning Israeli violence and inhumane treatment against Palestinian prisoners has not convinced Israel to end its illegal policies and practice. Despite international condemnation through numerous UN resolutions, peaceful protests by the Palestinians as seen through mass hunger strikes, demonstrations and peace talks which Israel fails to recognise and act upon progressively - Israel unrelentingly continues a modern form of warfare and apartheid unabated. To show support and solidarity for the victims of torture is to speak out against the crime of torture and to honour the victims and survivors of torture all around the world. On this day we urge that the freedom, loving nations to support our peoples plight against the brutal practices of the Israeli occupation. Image via EI. Caption - violent repression by all forces.